Pre-existing Conditions – These types of injuries are unrelated injuries that you already had, which are aggravated or exacerbated by your workplace. One example is a back injury, even if you don’t notice the pain caused by the injury until later. Injuries on-the-job – This category includes injuries caused by your company’s facilities (such as a chair in the company break room). Injuries during work time also include those that occur during coffee breaks, on your lunch break, and during work-sponsored activities (for example, a company picnic). Exposure to Toxins – This class includes injuries that results from exposure to toxins in chemicals from normal working conditions. An example of this type of injury is lung cancer, if you can show that it was caused by exposure to those on-the-job toxins. Physical and Mental Strain – This category includes physical and mental strain that is a result of increased work duties or work-related stress. In some states, a disabling mental condition that is a direct result of work demands or constant harassment from a supervisor may also be included in this category. However, there are some injuries that aren’t covered by workers’ compensation. The injuries that aren’t covered may vary from state to state. In some states, an employee can be compensated for an injury that he or she received while joking around at work. In some states, an employee would not be eligible for compensation for such an injury. Many states will not compensate an employee who is intoxicated when he or she is injured. Some states also bar employees who intentionally injury themselves from receiving compensation. Additionally, an employee generally won’t be compensated for injuries received while traveling to or from work. However, there are exceptions under which an employee will be eligible for compensation for work-related travel injuries. These exceptions include: when the employer has agreed to provide transportation for the employee, when the employer pays the employee’s costs for commuting, or if traveling is required as a part of the employee’s job. 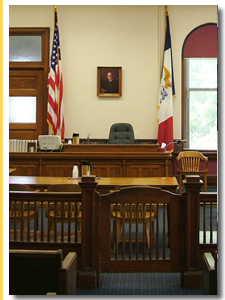 Contact a Iowa work comp lawyer representing clients in Newton, Iowa today to schedule your initial consultation. - If it’s possible, report your injury in writing and keep a copy of that report for your personal records. - If your injury entitles you to workers’ compensation benefits, file your claim as soon as you can. Waiting to file could lead to problems or delays in receiving your benefits. Reporting your injury and filing your claim quickly is the best way to make sure that you start receiving benefits quickly. - If there is a dispute regarding your claim, you can contact your state’s workers’ compensation commissioner’s office. You may also want to contact a lawyer experienced in the workers’ compensation system. The workers’ compensation system is designed to provide a simple and direct way for employees who are injured at work of because of their jobs to receive compensation for their injuries. Workers’ compensation laws vary from state to state. Each state has its own requirements for the procedure to receive these benefits. An experienced workers’ compensation lawyer can assist you in navigating these procedural requirements and can help you obtain the benefits to which you are entitled.